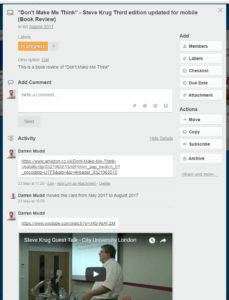 Trello is a free cloud collaboration system for organising projects. With its intuitive layout, Trello makes it easy to share information about tasks that are being planned, in progress or complete. It’s available for iOS, Android and Slack, but I’ve mostly used it on desktop. You can use it as part of a team for collaboration projects or by yourself. The free plan has so much to offer compared to the various paid alternatives. 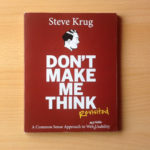 In fact, I’d say it’s the best tool I’ve come across for those who want a linear, coherent project management system instead of hundreds of emails. Not sure if you should sign up? Take the Trello Tour. The first thing you would do is create a team profile. You can create multiple teams. Give the team a name and description. By default, a new team is private, but you can change this to public in the team settings. 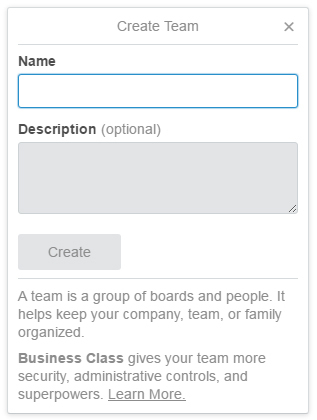 You can edit the team profile name, description and avatar, as well as creating new boards and team members. Team members are easily added using their email address. You can add them individually by email address or in bulk using a list of email addresses separated by semicolons. Each team member automatically has viewing, reading and writing permissions but these can be adjusted. A board represents a project. Under a board, you have increasingly granular options for adding tasks, permissions, filters and more. 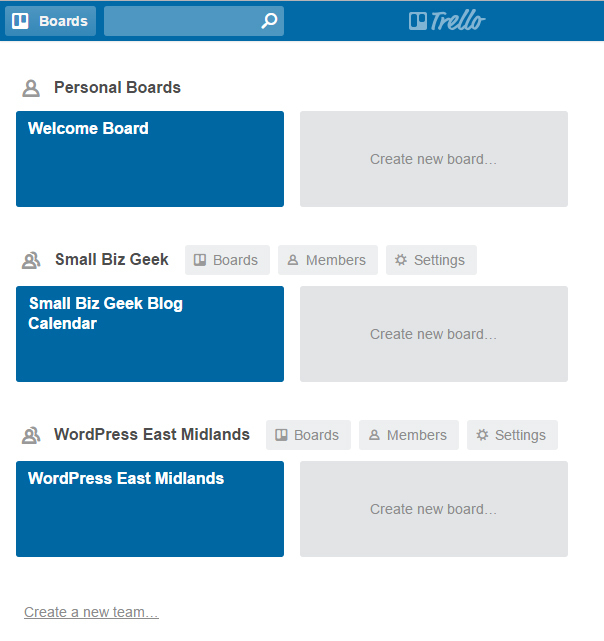 Multiple boards can be created for the different teams. 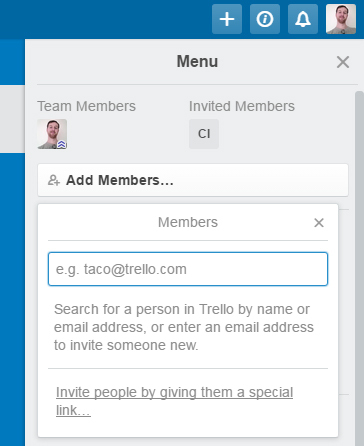 Earlier, I showed you how to invite a member to a Trello team using their email address. Well, it’s also possible to invite a member to a board who is not actually on your team. It might be that you just want to allow someone to view or contribute to your boards temporarily. New board members are invited to a board either by adding them using their email address or giving them a shareable link. You can give them permission to view, edit and write to a board. 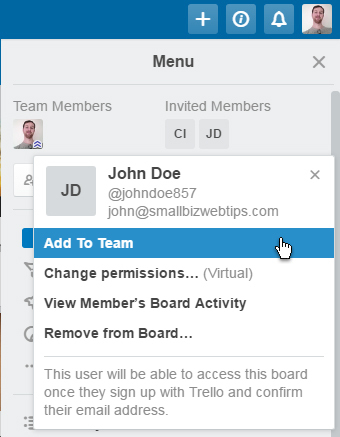 You’ll have the option to add a board member to a team. You would left click their profile icon under the Invited Members area of the Menu and click Add to Team. Trello lists are a subcategory of Trello boards. At this stage the project is divided into more specific areas as you begin to compartmentalise the team’s agenda. Under each list, cards are created which may then be moved to other lists. The cards are easy to use and packed with useful features, including the ability to add due dates, labels, media attachments, checklists and comments. The card comment system brings a social networking element to the software. The ability to @ mention team members, insert emojis and add hyperlinks contributes to a richer conversation than email. You may also add media from cloud services or your computer. Because I’m a big fan of unlisted YouTube videos, I would encourage anyone on my team to record a private Screencast or talking head video and attach the unlisted YouTube video to their Trello card comments. However you choose to use the system, whenever new activity occurs, you know instantly because notifications are synchronised across all your devices. Under the free plan, media uploads from your computer to a card are limited to 10MB. There’s a 250MB max limit on the paid Gold plan. 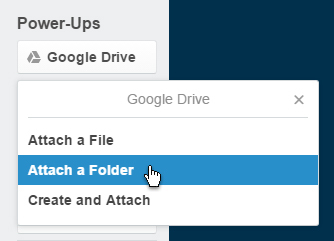 There’s a workaround for making larger media files accessible through Trello. 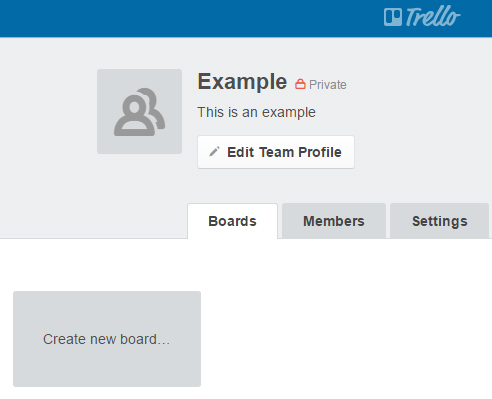 Under the free Trello plan you are entitled to one free Power Up, which is the ability to connect a third party app to one of your boards. 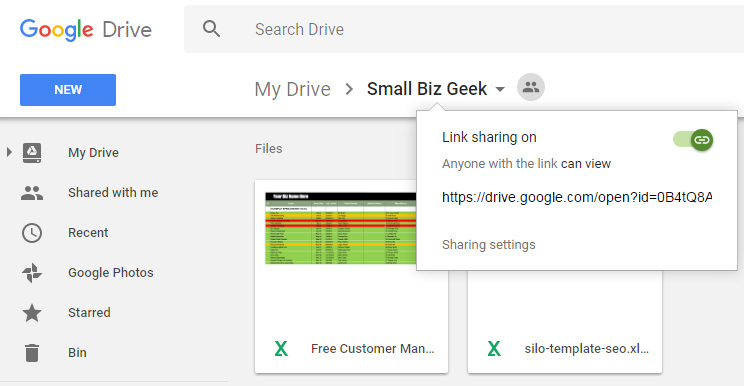 In the example below, Dropbox or Google Drive will be chosen and enabled as Power Up in order to link folders/files to a Trello card. Since DropBox storage starts at 2GB and Google Drive storage at 50GB, this will be better for very large files like high-quality raw video and audio. The integration is instant although it does require logging into your Google account. Boards belonging to free users can turn on one Power-Up at a time. If you desperately need multiple Power Ups for your other boards but don’t want to pay, just sign up for another Trello account using a different email address. However, even if you’ve run out of Power Ups, and you don’t want to pay for a DropBox or Google Drive integration with Trello, you could just sign up for them, create publicly shareable links to the folders and copy those links into a Trello card comment. 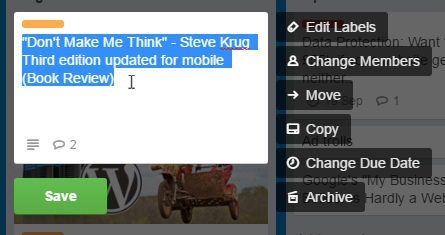 Then you can move files in and out of those folders and they will still be linked to the Trello card. Small businesses could leverage the power of Trello for just about anything from premises renovation and grand opening to a digital and print marketing campaign. When you get deep into project management, however, email is not so good for threaded team discussions. Email messages become lost or get relegated to the junk mail folder by zealous spam filters. 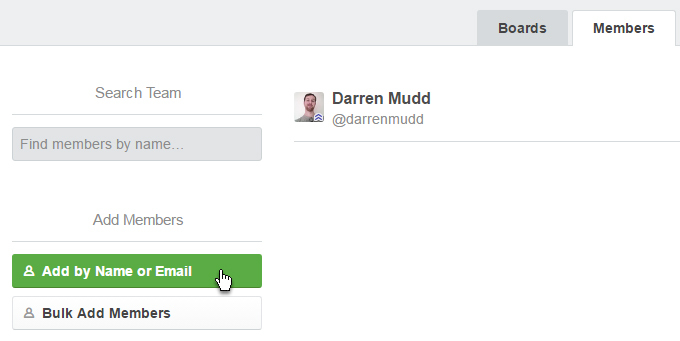 By contrast, Trello is clean, simple and chronological. A digital marketing team might work with an SEO client using a private board with the project broken down into smaller tasks. Using cards with videos, screenshots, checklists, word documents and spreadsheets uploaded as attachments to cards beats email conversations hands down. The fact that remotely based individuals can work together easily and for free is great.